Car accident lawyers in Boston should carefully review liability in these cases. In addition to an at-fault driver, other responsible parties could include the business or property owner. Parking lot design, lighting, signage, traffic flow, crosswalk design and other factors may contribute to collision risks. In such cases, business customers may have a premises liability claim, in addition to a negligence claim against the at-fault driver. Customers are legal entrants to business property under Massachusetts premises liability law. Thus, customers visiting commercial property are owed a duty of reasonable care under the law, which holds negligent business owners, lessors or property managers accountable for resultant injuries. While the law does not hold such defendants accountable for absolute safety, they are obligated to maintain their premises and keep them free from reasonably foreseeable risks. To prevail in a premises liability claim, plaintiff (victim) must prove by a preponderance of evidence that a defendant’s violation of duty to use reasonable care resulted in compensable injuries. Defendant also has a duty to warn legal entrants about any existing unreasonable dangers of which defendant is aware, or reasonably should have been aware. As we enter the winter season, snow and ice (or wet floors) are also common risks that result in injury. While Massachusetts once had a law that did not hold landowners responsible for injuries caused by the natural accumulation of ice and snow, that law has since been abolished by the Supreme Judicial Court, and so landowners or property managers may now face liability in such cases. Typical defenses in such cases include comparative negligence (you were partly to blame under M.S. Chapter 231 Sec. 85) and that a danger was “open and obvious.” Both of these defenses are often used in parking lot injury cases, as defendants and their insurance companies argue that victims acted in an unsafe manner and that parking lot hazards are known and well understood by business customers. A finding of comparative negligence can proportionately reduce a victim’s damage award. A finding that a danger was open and obvious can result in the loss of a victim’s claim against a property or business owner. A recent article in U.S. News and World Reports rightly advises motorists involved in parking lot accidents to do all the things they would do if involved in a traffic collision on the street, to include calling for medical help, calling the police and making a police report, obtaining the names and contact information for all involved parties and witnesses, and taking photographs and making other documentation of the accident scene. Distracted drivers are by far the biggest risk factor. CBS News reports as many as two-thirds of parking lot drivers may be distracted, resulting in hundreds of deaths and thousands of injuries each year. Drive slowly and pay extra attention. Too often, motorists let their guard down or allow themselves to become distracted upon leaving a public street and entering a parking lot. 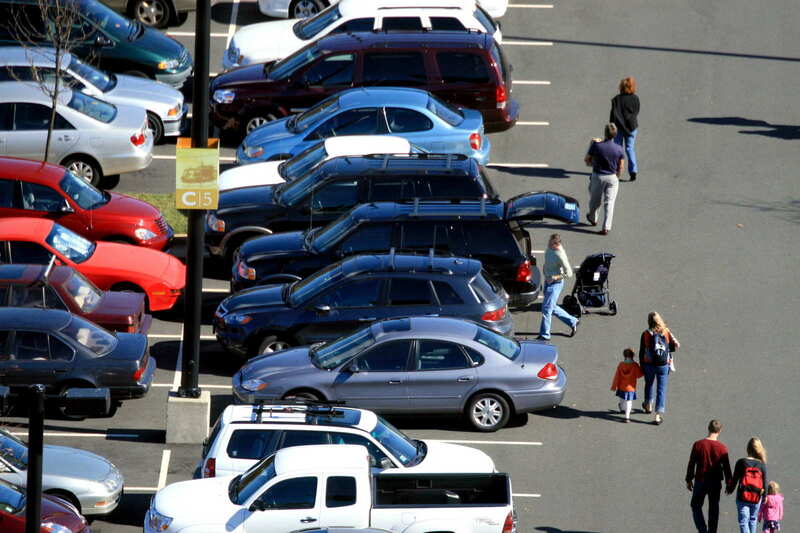 More than half of motorists report using cell phones in parking lots. Watch for other cars and pedestrians and use your turn signals. Try to pull through a parking space so you don’t have to back up when leaving. Always look behind your vehicle before backing up. Blind spots to the rear of a vehicle extend from 12 to 50-foot, depending on the size of the vehicle and the height of the driver. Parking further from the store may be safer when it comes to avoiding other vehicle and pedestrian traffic. However, single shoppers should also keep personal safety in mind, particularly after dark. Children and the elderly are most at risk of being injured in parking lots. Every week in the U.S. at least 50 children are backed over in driveways or parking lots. Parents should hold a child’s hand while walking in parking lots until the child is tall enough to be seen out of the rear window of parked vehicles. Teach a child never to play or sit down in a parking lot or driveway. Driveway accidents are a common risk for small children, particularly during large holiday gatherings or while visiting relatives. The American College of Surgeons reports half of non-traffic child deaths in the United States result from a child being backed over by a vehicle (another 25 percent involve a child being left in a hot car). Other types of parking lot claims include fall injuries and assault. By understanding the risks of parking lots this holiday season, you can be in a better position to prevent injury. However, when an at-fault party still causes an accident, seeking the advice of an experienced Massachusetts personal injury law firm is best done as soon as possible.